A weekend trip to Antwerp has been planned for ages, not knowing that SACRILEGE would be playing at the Rocking Bull Concern. For a moment METAL MIRROR in Aalst came in the picture, which got cancelled, so we were very much looking forward to seeing SACRILEGE in this lovely city of Belgium. In the afternoon we already checked out the new location of The Rocking Bull at the Sint Katalijnevest. It’s a large metal store with a bar and a small live stage. This is really a 'must see' for every devoted metalhead and situated at a very central location. The week before, KILLER has actually played there, who are one of my favorite bands from Belgium and I have seen them many times. 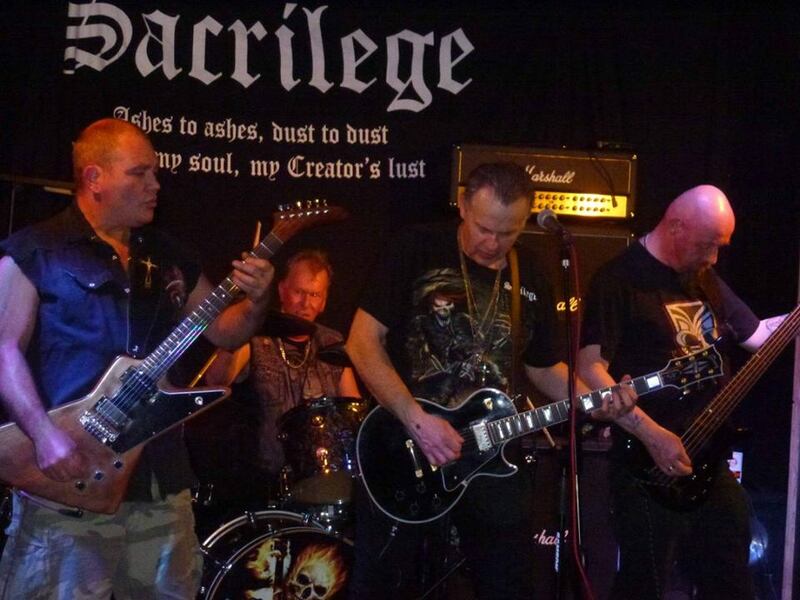 This weekend however it’s party time for SACRILEGE from Great Britain. 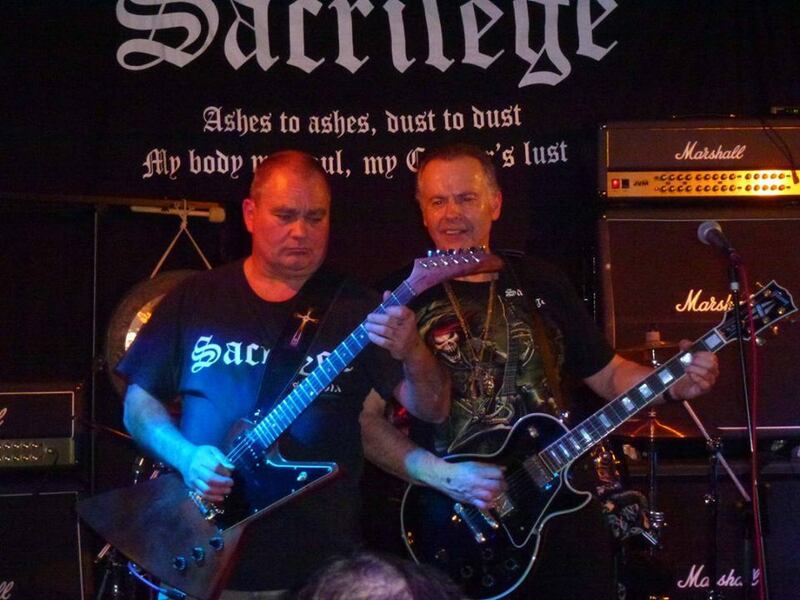 Beware, there are more bands around that call themselves SACRILEGE. 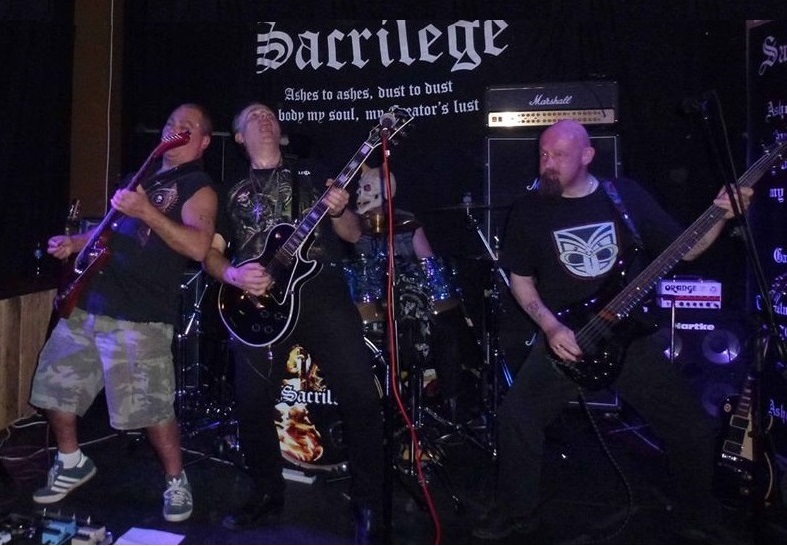 A few weeks ago I’ve reviewed the thrash, doom metal band SACRILEGE from Birmingham for Metal Maidens with a female singer. 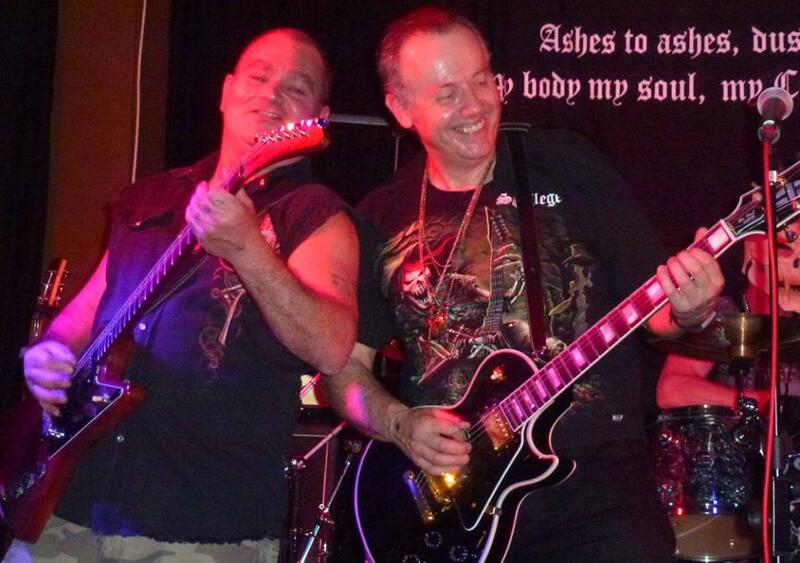 This is the four piece heavy metal band from Gillingham from the county of Kent. I didn’t know the band too well, simply because their albums are very hard to find, besides the last two albums, that have a good distribution deal on the continent. Here’s a short review of what happened on that magic night in Antwerp. 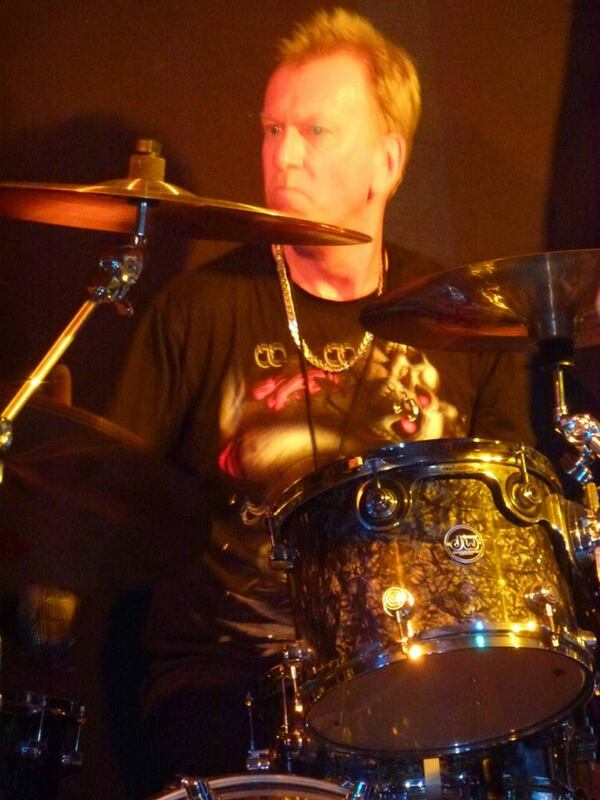 We’ve met the devil and he played the drums tonight, how about that? A week later I actually found out who this drummer is and my heart skipped a beat for a minute. Read on why. We arrive very early at the Rocking Bull and I’m glad that we did, because the band will actually play two sets with a short break in between and they will not start at nine, but already at a quarter past eight. Phew, that was close. The place isn’t exactly crowded, but better to play for a bunch of real metal fans rather than a sold out gig, where nobody is really interested in the band and only checking out the latest tweets on their phone, like we see happen very often. 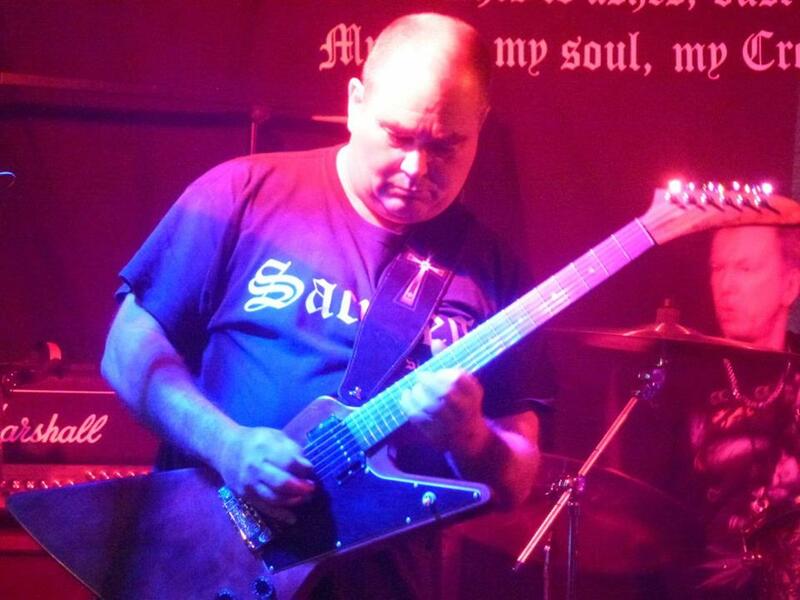 Before the sound check takes place, we have a short chat with Bill Beadle, the singer and guitarist of the band. He’s telling us that the show on Friday wasn’t that crowded either, but they gave it a full hundred percent. Now, that’s the spirit and I’m sure that it all will work out all right. We walked around the area for a couple of minutes to give the band the chance to set up their gear and made sure that we are in the house on time. During the soundcheck, it becomes evident, that the band won’t be able to play it out loud, simply because the vocals can’t be mixed in loud enough with the guitars, bass and drums. Also, the sound on stage isn’t good either. After some adjustments, the band is ready to rock, so far so good. The song “We Gotta Get Out Of This Place” starts after the intro and I thought they had just arrived? Those British and their lovely sense of humor! The show continues with “Running Scared” and “Lies” and I must say that the sound is quite good now. It’s not that loud but very clear and I’m sure that I won’t have this annoying beep in my ears after the show. “Lies” is the new single and taken from their soon to be released album “Court Of The Insane”. 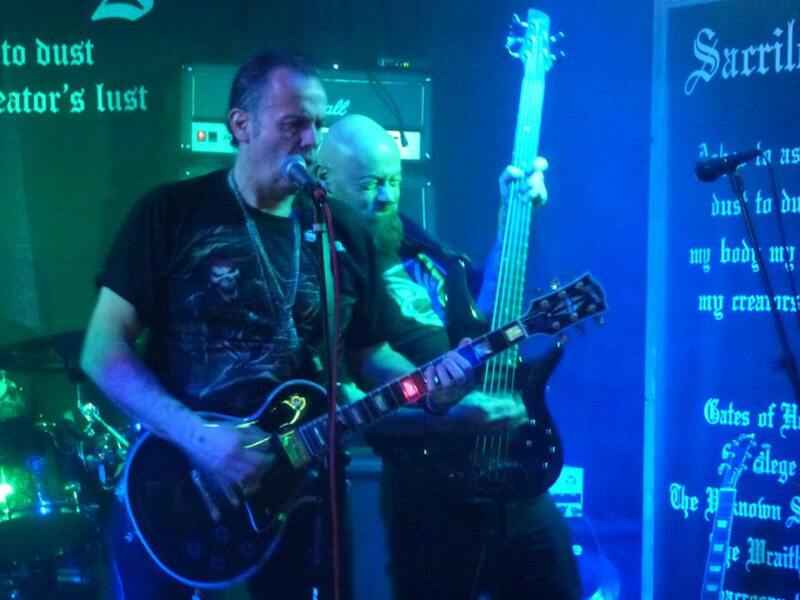 The sound of the band is a mix of old school hard rock and heavy metal, NWOBHM (of course) and doom metal. Mix BLACK SABBATH with JUDAS PRIEST, MOTÖRHEAD and IRON MAIDEN and put some CANDLEMASS, PAGAN ALTAR and WITCHFINDER GENERAL to that to get the right combination. The songs are not always easy on the ears, but their amazing sound is adventurous and they never sound commercial or whatever. This is the real deal for fine tasters and connoisseurs like me. “Whore” is a simple title, but this is how the band used to sound back in the early days. “Cry Of The Night” shows, that SACRILEGE likes to focus on many different subjects and their songs also carry out some kind of message. These guys have been in Belgium and they have seen places that remember of World War I and the song “The Unknown Soldier” is definitely about that. Heavy metal is not only about partying and nice girls, you know. 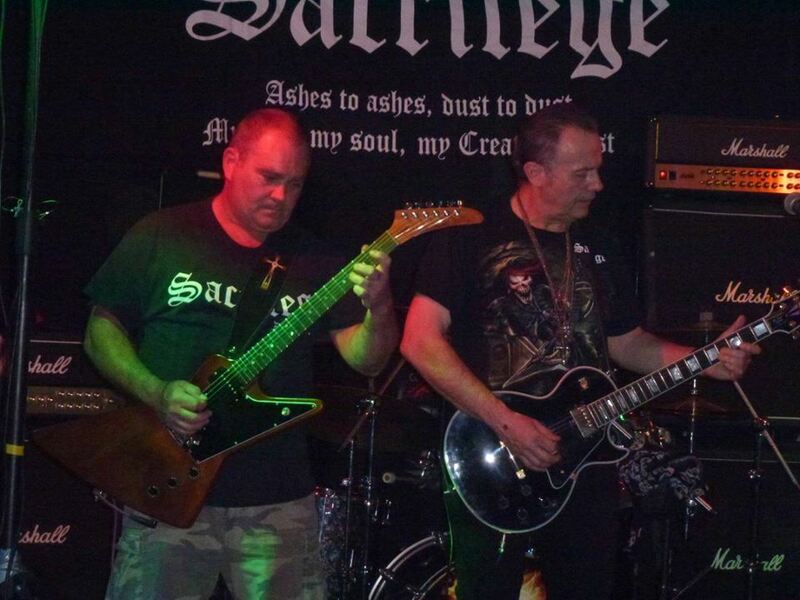 SACRILEGE likes to add a nice horror twist to their music and create a dark atmosphere to that. They use it as a show element on stage. They won’t go the easy way and because of that attitude they easily gain my interest. I like a hard working band, that is not doing their thing as a routine job. These guys are playing like they are in front of a full Wembley Stadium, while The Rocking Bull is a little bit smaller (lol). It’s their positive attitude that counts. Two times forty-five minutes they give it the full hundred percent and possibly a little bit more. “Rat Race” continues and the sound is getting a better balance. Obviously, the band is really enjoying themselves very much and everyone joins in when the choir vocals are needed and sometimes they get help from the people in the audience. There is even some room for some tongue-in-cheek humor. I really see a bunch of friends playing for their friends. That’s the feeling I get. Two personal favorite songs of mine are up next, “Sacrilege” and especially “The Prophet”. These songs are a little bit more epic and prove that this band really knows to write some exciting songs. “No Respect” sounds a bit lighter and invites the crowd to shout it out loud. After that, it’s time for a short break of about ten minutes, which is just enough to take a leak and have a look at the CD merchandise. The curfew is at ten o’clock exactly, so the band has to make sure they are back on time. The second set that SACRILEGE is playing tonight is so much better than the first one. The band is pleased that the sound in the club is good enough and already at the beginning, they have a very nice surprise for us. Something we didn’t expect to happen right away. 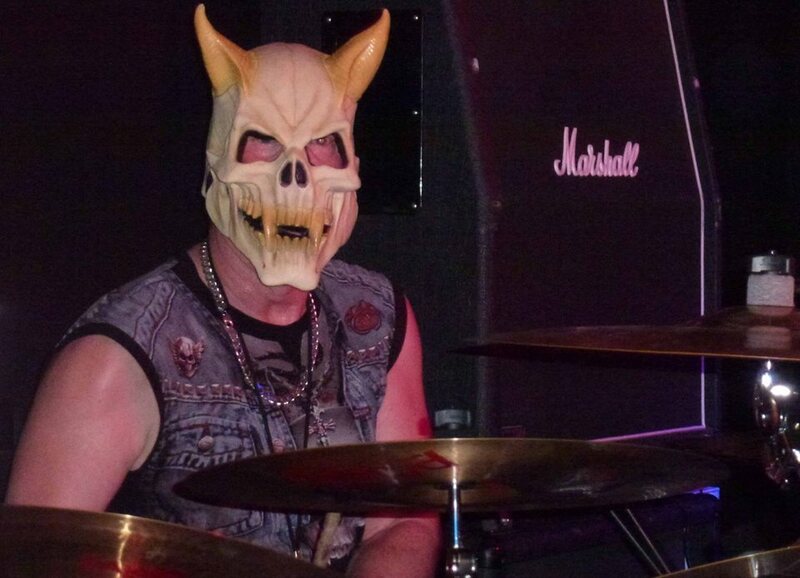 Drummer Neil Turnbull put on his devil masque during the wild rocker “In Hell”. The photographers jump up and down to make sure that they shoot some great pix of this memorable part of the show. Next to that, Neil used drum sticks that seem to glow in the dark. It’s an explosive view, which really adds something special here. Afterwards, when doing more research for this article, my mouth fell open with surprise. I didn’t do my homework properly, that’s for sure. 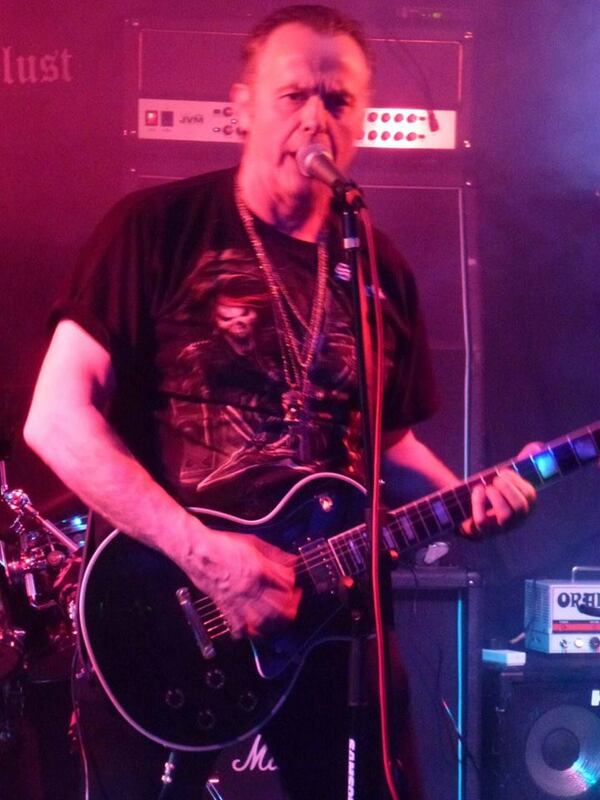 I do have a very few albums from the NWOBHM underground scene that I L-O-V-E a lot and they are not the ones that everybody is talking about and my own personal picks. One of these albums is called “Some Monsterism” by DERVISH. When I looked at the name of the drummer, Neil Turnbull, I went to the room where our vinyl collection is stashed. 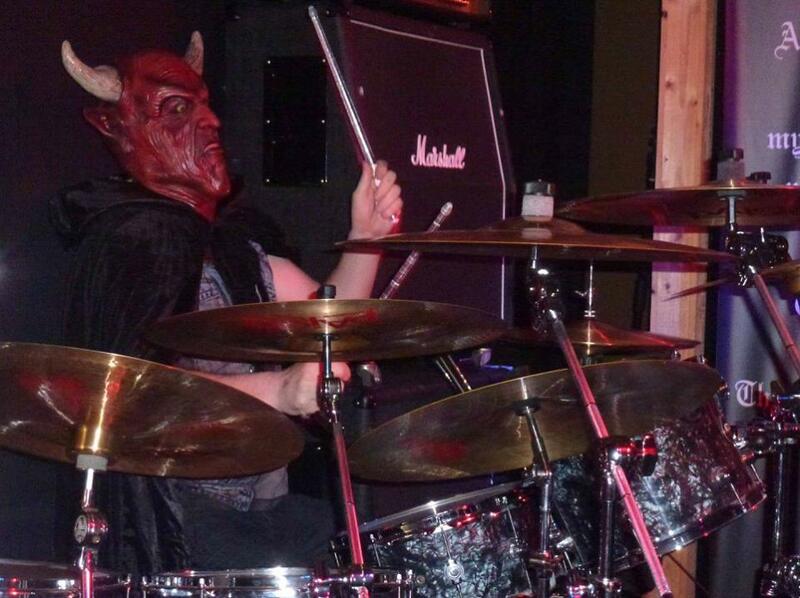 And right there on the DERVISH album I found the name of the man behind the drums dressed up as the devil himself. What a shame I didn’t know that on the evening itself. He’s the only member, who got a solo spot tonight and that was well deserved, because the man’s just a mighty fine drummer and a true hero, who was sweating bullets tonight. But let’s get back to the show, where the band continues with “Lucifer’s Soldiers”. The set list of tonight features some of the impressive works of SACRILEGE ranging from the very old stuff to the new, yet unreleased material. All songs of tonight have just that little bit of extra, that lift them up to far above average. I’m very thrilled to see a band giving it all and playing some great music. “Live Another Day” continues and after that we’re invited to “The Dragon’s Den”. The guitar work is absolutely fabulous and the band is really working together as a unity to make something special out of these songs. I guess, we’ve been witnessing a very special gig here tonight, people. These positive vibrations reflect towards the crowd and turn this night into a very special one. 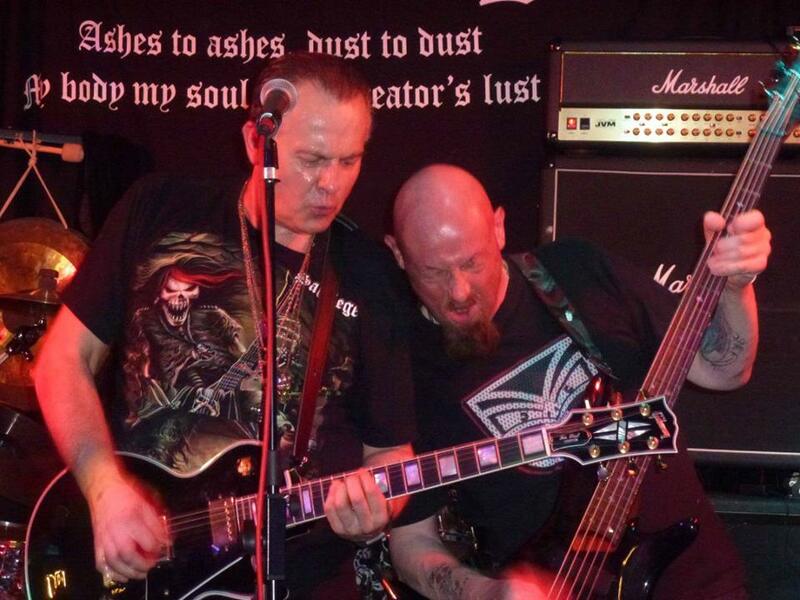 A once in a lifetime experience that I mostly have with NWOBHM bands. DEEP MACHINE in Aalst was one of them, MYTHRA in Aalst was definitely one and this SACRILEGE gig in Antwerp is another one on my list. “The Wraith” is on next and that’s the title track of one of their earlier albums, from 2012 to be exactly. The band shows a bit more expression in this second set. They just give it all they’ve got to make it a great gig, although there are not so many people there, who are able to enjoy it. “In The Arena” contains of a great overview of the band’s material. A lot of the songs are on the compilation album “Best Of Sacrilege 1983-2012”, by the way. “Ashes To Ashes” and “I Can Hear The Silence” keeps the flow going. In the meantime, it’s made sure to the band that the show must stop at 22:00 hours. I think, the club has only a license for these kind of shows until ten and then things have to be quiet. After this signal the band is destined to put a step on the gas to get the complete set going. There are still two more songs on the list and the crowd has moved a little bit forward to get closer to the stage. “Rock And Roll With The Devil” is next and for this particular song Neil put on another masque and this skull faced drummer is now taking the leads. The band is hot, the club is cooking and soon we can see the roof rising. This is really awesome beyond belief. What a great night. The clock is ticking though and Neil doesn’t even get the chance to put off his masque and during “My Time To Die” he leaves his masque on. It doesn’t get any weirder than that, folks. The referee blows his whistle and with the last riffs, SACRILEGE closes their second set tonight and they receive a standing ovation from their fans. What a great night. Thank you Bill, Neil, Jeff and Tony for an awesome gig here in Antwerp. It was quite amazing to see this band in action tonight having so much fun on stage, despite the bad sound (at least on stage). 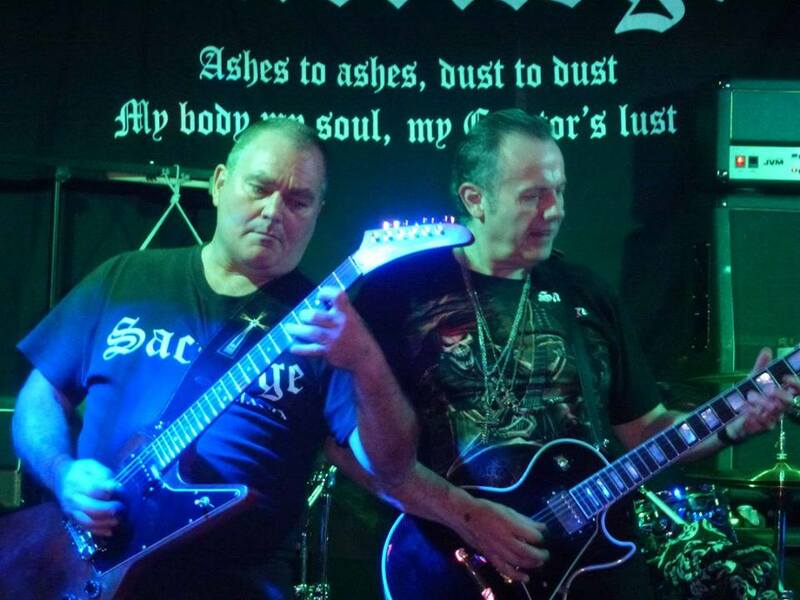 The sound of SACRILEGE goes just a little bit further than the average NWOBHM sound. They create an atmosphere of dark doom and horror and give their audience a lot more than the full hundred percent to make their show really something special. Rather unknown, when we went to the Rocking Bull before the show, but after seeing them live and meeting these guys, we really felt special and privileged to have witnessed this gig. This all led to seven CD’s, that were being added to our massive music collection. The new one is on its way and I’m really looking forward to hearing it, because this band is like a diamond in the rough you only find once in a lifetime. We’re glad that we found them in Antwerp. Hope to see you back soon on the continent, guys. Ashes to ashes, Dust to dust. My body my soul, my Creator’s lust.